NAYPYIDAW -- Ms Aung San Suu Kyi's party has taken an unprecedented public mandate into Parliament. But popularity and power are only the beginning for the Nobel laureate and her hundreds of new MPs, many of whom have no experience of public office. 1. WHO WILL BE PRESIDENT? Ms Suu Kyi's party can form a government, but who will lead it? The Nobel laureate is barred from the presidency by a clause in the junta-drafted Constitution because her children are British. Many believe it was scripted specifically to block her path to power. 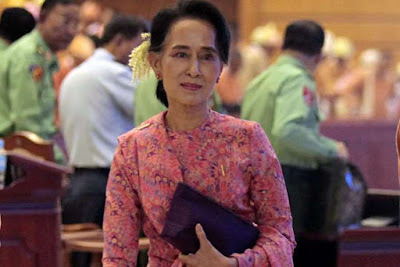 She has said she will rule "above" a puppet president, who will replace outgoing President Thein Sein in late March. If she does, that position is not covered in the Constitution and could rile the powerful military, who have ceded some powers but retain 25 per cent of seats in Parliament - and with them an effective veto on major charter change. Given the presidency issue, Ms Suu Kyi may need to sweeten up an army which held her prisoner for some 15 years. Observers say good relations between Ms Suu Kyi and the military will be crucial to get anything done. That is because the military's political powers are not limited to Parliament. The 2008 Constitution that was scripted under former dictator Than Shwe hands the army chief control over three key ministries: home affairs, defence and border affairs. Home affairs is a bureaucratic juggernaut, and includes the police force and the sprawling General Administration Department (GAD), a vast network that forms the backbone of the civil service. Civil wars continue to rage in parts of Myanmar's ethnic minority borderlands. Myanmar's ethnic minorities have fought for greater autonomy for more than 50 years. Mr Thein Sein signed ceasefires with several of the country's major ethnic armed groups, but heavy fighting continues, particularly in Kachin and Shan states. As a member of the ethnic majority Bamar, Ms Suu Kyi has sometimes been viewed with suspicion by these groups. But her National League for Democracy (NLD) won handsomely in ethnic states, and Ms Suu Kyi has pledged to work towards a federal system. Ms Suu Kyi must also tackle the scourge of anti-Muslim sentiment that has fomented since an explosion of unrest in Rakhine state in 2012 between Buddhists and minority Rohingya communities. Tens of thousands of Muslim Rohingya are still trapped in bleak displacement camps and the next government faces pressure from the international community to find a solution for them. But they will be wary of enraging Rakhine Buddhists, who largely see the Rohingya as illegal immigrants from neighbouring Bangladesh. Myanmar's economy has surged under reforms by Mr Thein Sein's government. Foreign investment swept in as most Western sanctions were lifted. Mobile phones are now ubiquitous, car imports are rising fast and several special economic zones are in the pipeline. The economy grew at 8.5 per cent in the 2014/15 fiscal year, but the World Bank expects this to moderate to 6.5 per cent this year. But poverty is still a problem for huge swathes of a country that relies on agriculture. With many of the previous government's so-called "quick win" policies already enacted, the NLD has said it will focus on luring more international investment. Speedy development is held back by patchy electricity supply, poor road and rail networks and an unskilled workforce. Graft is also endemic. Myanmar ranked in joint 147th place out of 168 in Transparency International's 2015 corruption perception index. There is also the question of febrile relations with China - Myanmar's biggest trading partner.